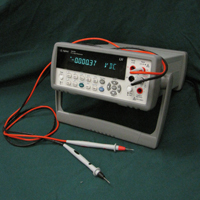 The Agilent 34410A digital multimeter has 6 1/2-Digit DMMs and represents the latest generation of multimeter from Agilent Technologies. 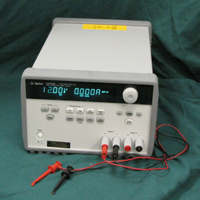 Building on the phenomenal success of the industry-standard Agilent 34401A, this meter has an improved accuracy, expanded measurement capability, significant speedup in measurement time and throughput and has both LAN and USB interfaces. The 34410A has a dual display and dual measurement capability. With the output power of 30 Watts, the Agilent E3646A programmable DC power supply provides a great performance at a great price. The E3646A delivers clean power, excellent regulation, fast transient response and has a built-in GPIB and RS-232 interface. Both voltage and current levels can be set to a maximum resolution of 10 mV/1 mA from the front panel. In addition, the E3646A can store and recall up to five complete power supply setups using the internal non-volatile memory. 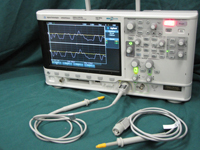 The Agilent DSO-X 2012A Oscilloscope has superior performance and capabilities that are not available in oscilloscopes in its class. With the large 8.5" color screen and the fastest update rate of 50,000 with 100 kpts memory the DSO-X 2012A is a excellent tool for use in any lab. The performance is further enhanced with the built-in 20 MHz function generator and 200 MHz bandwidth oscilloscope with a sample rate of 1 GSa/s, this oscilloscope can be use over a wide range of applications. Horizontal tensile stage for testing polymers and composites under Leica binocular microscope. The Instron 3344 single column system is designed for both tension and compression tests less than 2 kN (450 lbf). The system is ideal where portability and/or lab space is at a premium. 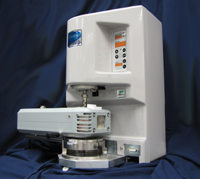 The 3344 ssytem is a simple to use system that offers both performance and affordability for quality control and product testing and the 42" test space allows for a wide range of sample sizes. The available 10lb. 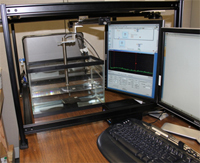 and 450lb load cells work well for testing thin sheets, individual fibers, or low strength tensile test specimens. 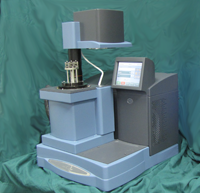 The TA Instruments Q20 Differential Scanning Calorimeter (DSC) with modulated DSC measures temperatures and heat flows associated with thermal transitions in a material over a range of -90 C to 550 C. The properties measured by the Q20 includes glass transitions, "cold" crystallization, phase changes, melting, crystallization, product stability, cure / cure kinetics, and oxidative stability. System includes the Modulated DSC for precise control of amplitude and period oscillations for heating and cooling. The Refrigerated Cooling System is a two stage cascade vapor compression refrigeration system for programmable or ballistic cooling over a temperature range of -90 C to 550 C.
The TA Instruments Q50 Thermogravimetric Analyzer (TGA) with Mass Flow Control measures the weight change within a material as a function of both time and temperature under a highly controlled atmosphere. 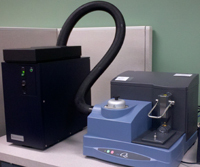 This device is essential in understanding a material's thermal stability and composition. 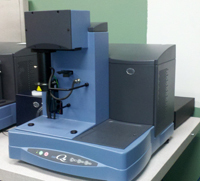 The TGA has an auto-switching dual range microbalance (0-200 mg and 0-1 gram) with automated pan loading and furnace movement with dual mass flow controllers with automated gas switching. The US Ultratek PCIUT3100 All-in-One ultrasonic pulser/Receiver has a 100 MHz A/D board and can drive transducers up to 25 MHz. The combination pulser-receiver allows a wide range of prototyping and offers full control of teh pulse width and pulse voltage for non-destructive testing (NDT). The system is coupled with the Velmex X-slide x-y translation system and is synced with an in-house code for full C-scan capability.